The Eleventh Hole is a very picturesque par 3. 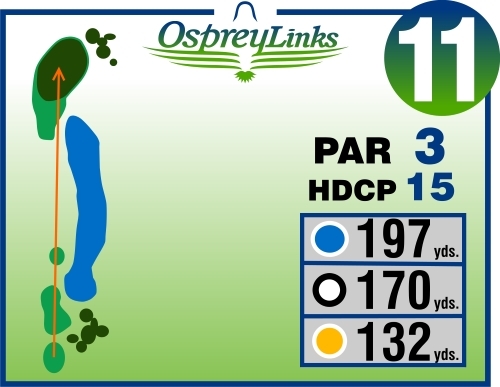 Normally it calls for a well struck mid-iron off the tee, but hit it straight. The hole is guarded by water for its length along the right and woods to the left. And the Canadian Shield provides a wonderful rock wall surrounding the green for both a stunning view and formidable obstacle. To Book A Starting Time Your Browser Must Support Java Scripts. Select the day you wish to reserve. Click on “pencil icon” beside the desired starting time (Mobile Devices and Tablets, swipe from right margin to left to reveal pencil). Enter your user name in the box (where it says “Make a selection”) or if you are not a member, enter your name and email address in the Qwik Entry Fields. Do similar for all members of your group.